My family loves fresh peas. We’ve had quite a few years when the peas didn’t get off to a good start. But now I know how to germinate peas indoor we have a good crop each year. And you can too. We love sugar snap peas and they grow well in the cooler weather, so they are one of the first crops I can plant each year. But some years they got off to a good start and other years not so much. Then I discovered how I could get them growing well each year by germinating peas indoor before planting them in the garden. Now, this is the only way I grow peas and you can try it too. 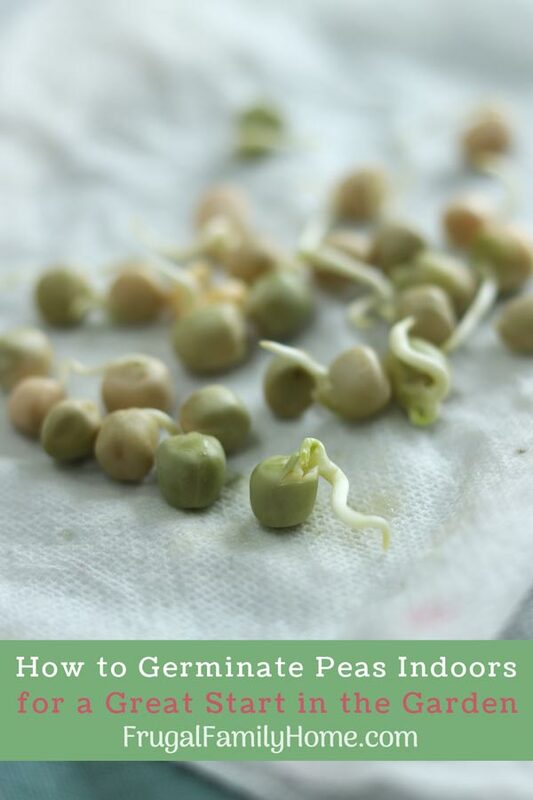 You might wonder, can you start pea seeds indoors? And yes you can I start my peas off each year by germinating them indoor and then planting them outside. But I don’t germinate them in the soil. Instead, I germinate them inside a paper towel. Once they are sprouted, then I transplant them into the garden. I’ve found this process works best for a few reasons. For years I would start my peas in the garden. When the soil was ready to work, I would turn the soil, plant my pea seeds and wait. Some years they would sprout up beautifully. Other rainy and cold years, they would sit in the soil, get waterlogged and slowly rot away into a glob of moldy mucky messy. Sprouting sugar snap peas indoor also had an unforeseen benefit too. In the past when I would directly plant my sugar snap peas into the garden without sprouting them first. The birds would eat the seeds. I think I would lose at least a third to one-half of the seeds I planted each year. I wanted to grow peas not feed the birds, so it was frustrating. But once I germinated the sugar snap peas indoors, I found they grew even if it was rainy and cold. And the birds would leave them alone once they sprouted. To get your peas off to a good start and won’t have to worry about pesky birds, rotting seeds or problems when transplanting, start your peas indoors. With only a few items you can germinate your pea seeds today and in a week have them in the garden. I made a quick video on germinating peas indoor for you. I’ve also written the directions below in case watching a video isn’t for you. Gather your pea seeds. We grow pole peas, the ones that need support and bush peas, the ones that can support themselves by intertwining with their neighboring plants. Grab a Paper Towel or Two. I use paper towels to keep the seeds moist unit they sprout. It works great and you have some on hand right now at your house. Zipper Topped Bag. 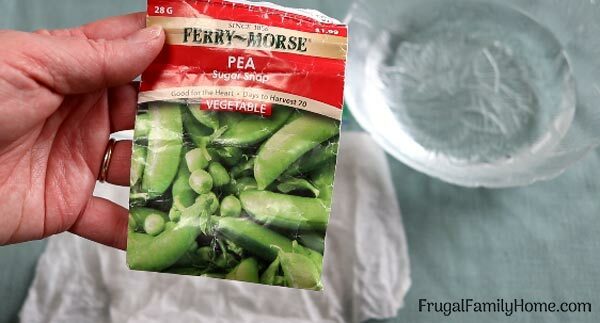 Sealing the peas in a bag to keep them moist is important so they don’t dry out. I use a regular zipper topped sandwich bag. Once you have your supplies, it’s a simple and quick process. Moisten the paper towel with water. Wring out any excess water, the towel just needs to be damp but not dripping wet. Lay the wet paper towel on the table. Place the seeds in the middle of the towel and fold over to cover the seeds. Fold in each of the sides to make a pocket for the peas to stay in. This will prevent them from rolling out when you slide the paper towel pocket of peas into the zipper topped bag. Slide the peas in the wet paper towel and zip to close. 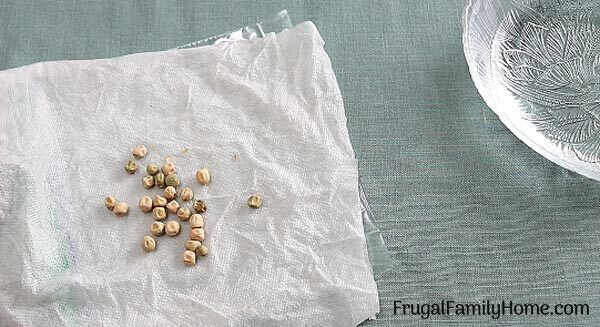 If you are sprouting more than one type of pea, be sure to label each bag so you know which peas are which. 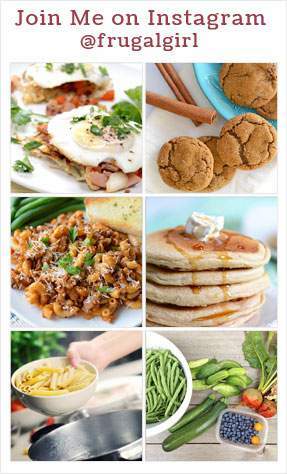 Place on the top of the refrigerator and let sit for 3 days. Check on the peas. If the paper towel is drying out, add a little more water. It’s important that the towel stays moist. After 7-10 days your peas should have sprouted and they are ready to plant in the garden. How long Does it Take a Pea Seed to Sprout? If you direct plant, the seeds and it’s cold outside, it could take almost a month to get them to sprout. And if you live in a rainy area like I do, they might rot instead. 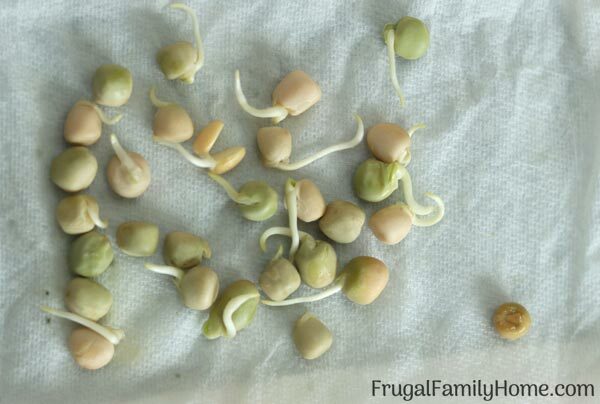 If you sprout them indoors, it takes about 7-10 days to get the peas sprouted. Then once sprouted they can be moved to the garden to grow. That’s all there is to germinating peas indoors before planting them in the garden. It’s a simple and easy process but it can get your peas off to a great start. 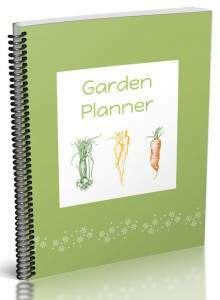 If you’d like to read more backyard gardening tips, check out our gardening section. Thanks for the tips, Shelly! 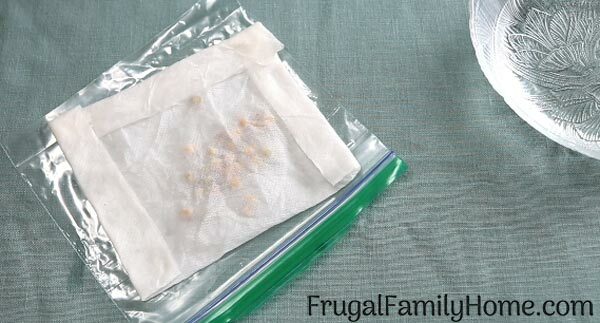 Your post reminded me of how we sprouted beans inside our house using a paper towel, a cup, and water for a homeschool project some years back. We then successfully planted the beans and grew bean plants. It was a lot of fun. Of course, we didn’t grow enough beans to make a whole pot of beans on the stove but it was a nice way to learn about planting beans and growing them. Thanks for sharing! 🙂 I hope you get some yummy sugar snap peas this year!